"Thirty years after the release of their first album, Yes performed for the fourth time in Buenos Aires. Last year, to present a middling album as Open Your Eyes, the band offered a concert based in their golden classics of the 70s, adding only two new songs to the setlist. After all, it was the first time that Yes visited Argentina with the historical guitarist Steve Howe. This year, instead, Yes recorded The Ladder, a formidable album that summarizes in style their history and has nothing to begrudge from the best of their former production. The heroes of progressive rock decided to present six new songs, alongside with classics as Yours Is No Disgrace, Perpetual Change, Roundabout, Paul Simon's America, Awaken or Hearts. And they succeded, because the new songs are as good as the old ones and the emotion was the same as ever: one needs only to flow to enjoy a music with a highly uncommon creativity in these days' rock. From a technical point of view, Yes' performance was irreproachable: the band comes near to perfection in complex instrumental passages that seem almost impossible to perform live. The role of bassist Chris Squire and drummer Alan White in the creation of musical atmospheres exceeds by far the 'rhythm section' clich=E9. There are not many guitar players as Steve Howe, and the magical voice of Jon Anderson remains unimpaired after three decades. The younger ones match the rest. Billy Sherwood - not so newbie, he's been ten years in Yes - shines in the rocker passages; and keyboardist Igor Khoroshev - a fan but not a clon of Rick Wakeman - adds a certain jazzy nuance in the arrangments. 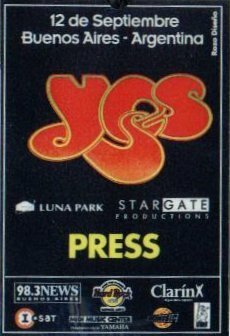 As other important groups of rock story, Yes has already made its more substantial contribution: a music as original as inimitable that expanded the boundaries of the genre. Now they just record works as good as The Ladder and perform shows as touching as the one in the Luna Park. The legend is alive, and in excelent health. We were pleased to receive Yes here in Buenos Aires on september 12th. Their music was wonderful as ever. Two hours and 10 minutes of Yes music left us breathless. They performed 4 themes of their new album, and an unforgettable version of Awaken. Stadium was full, but it was a pity that sound was not preety good. I don t know if Yes brought their own sound equipment or it was provided by the organizer. Certainly this stadium (Luna Park) is not the best place in Buenos Aires to hear music. Steve was particurarly brilliant last evening. It was a pleasure to see his fingers, although he had trouble with his gitars: he permanently looked at his assistant for tecnical support and seemed to be uncomfortable with the situation. surprised all of us carrying an enormous triple-bass that only his hugh humanity could hold. Yes: come to Buenos Aires any time you want. You will sold out in every stadium where you ll perform. You have thousands of fans in Argentina. Yesterday 12/9/99 at 21:30 hs. the band played at the Luna Park in Buenos Aires. It was a nice show because of the great communication between the guys and the people. The songlist was the same as in Sa� Paulo in Brasil: Yours is no disgrace, America, Lightning strikes, New language, Perpetual Change, Homeworld (one of the peaks of the show), Clap-Mood for a Day-Ram, It will be a good day, Owner of a lonely heart (With crazy solo of Steve Howe at the end of the song), Hearts, Nine voices, Awaken (the other peak of the night), Roundabout, Encores: To feel alive, I�ve seen all good people. But the great show had it�s troubles: 1)for the maniacs: Alan White missed. Yes, at the beginning of America he began to play another song (yours is no disgrace again), it provokes jokes between Jon, Chris and Alan, and when the song finished Chris played a few notes of this song looking at Alan. 2)Troubles with the encores: In To feel alive at the end of the song there was distractions wich made Jon feel angry (and we noticed it), and the trouble was again Alan. At the beginning of ISAGP Howe dissapeared and Jon tried to introduce him but he wasn�t there. So Chris saw at Billy for beginning the guitar part, but the guy missed the pedals (few little words between them). Howe appeared and we had our encore in �peace?. But afterwards the show was great, and the people really liked the new songs (the record isn�t in shops here). The chorus are more and more responsability of Billy, the old Chris is a little lazy. Jon is Jon, and I agree with the boy from Brasil who wrote that he�s singing not for perfection but for big, huge communication with us. He try and win, his voice is really an �angel�s embrace�. Chris as always (but thank God without Heart of the Sunrise), his work in Awaken is amazing. Steve played with his usual energy but, for me, it wasn�t his night. He played well but with no surprises. Alan, well I told that he missed a couple of times, but when he plays is the strongest. Billy made some interesting stuff with the guitar, and he really sings. Igor is so respectful. I supose that he�s not really free for playing. He does it very well, but without changing the parts of Wakeman or Kaye, and personally I want him to do it, because Yes have always been a question of creativity and inspired players.. The worst thing of the show: they didn�t play South Side of the Sky, I read a gossip wich said that they rehearsed this song but...the next, maybe. I recommend eyerybody to go. The band is really back, alive, enjoying and playing. A warm Sunday afternoon announces that winter will soon be over. The Luna Park is almost full in its capacity, 7,500 people waiting anxiously for a Yes concert. The stage setup is simple. A white screen as background, the square logo hanging. At both sides of the stage, the six symbols found in the cover of The Ladder in a row, like a totem. Mostly Native American symbols, one for each Yesman, as explained by Alan. From left to right, from the point of view of the audience: Steve - Igor (behind) - Jon - Alan (behind) - Chris - Billy. They sound tight! Steve jumps and hops and moves. Next to the end of the song, the band stops and Steve plays an extraordinary electric guitar solo, not the original one, a new one, in the best rock guitarists tradition, followed by the band rocking the place down, until they catch up again with the main theme. The hilarious detail. The band started playing America, but Alan began to play Perpetual Change. Stop! Stop! Everybody broke in laughter, band and audience. Chris and Steve almost laughed their heads off pointing at Alan. Jon made funny faces to the audience. We all laughed and clapped. Steve plays acoustic, whilst the lead electric is Billy's. A great song and the band played it tight and very enthusiastic, really enjoying it. A new classic. This time Alan didn't miss :-)). A high point to listen to this classic live. If HW is announced as a new classic, I can say that performed live increases the quality of the song. 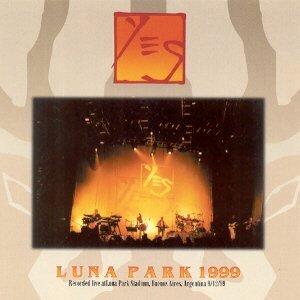 The atmosphere that Yes creates with this song has something of an anthem, the feeling that the six Yesmen put into it is subtle and emotional too. Along Steve's acoustic part at the end, Igor plays some piano. In the final voice/piano duet, Igor follows the same chord progression as the studio version, but played differently, more open. The variation of the setlist. Steve absolutely inspired, bnding, twisting, hopping under the spotlite, ensing with a wide smile, as if he was a triumphant teenager just achieving a feat. Nice new song, played in a relaxed way. Steve DID NOT LEAVE the stage. He was as concentrated and enthusiastic as the rest. Billy plays the solo very tightly, very well, and obtains a big roar from the audience. To the end, Steve adds a long, technical and breathtaking solo, his guitar seems inflamed. A relax after Steve's solo. Billy sings Trevor's parts, but his voice is richer and quite more expressive. Steve adds steel guitar, Chris looks possessed by the emotion. What a song! All the band comes in to sing. The vocal harmonies and the atmosphere is one of the peaks in the emotional level. What can I say? The climax. As for Igor - test passed. He played beautifully, didn't miss a single note. Jon takes his arp, closes his eyes and comes and go all through the stage, with eyes closed, playing, singing, moving his body, moving his hands, opens his eyes and looks towards the ceiling - he seems a shaman peforming a healing ceremony. All the performance is so powerful, the audience was mesmerized (still am). At the end, nobody could stop clapping, even the band! Party time!!! Everybody healed? To celebrate!! With a very catchy chorus, soon learned by all the audience, who sang along. The grand finale, with everybody singing, dancing, jumping. Huh? More than two hours of concert? Can't believe! Muchos Gracias. Thank You. Thank you so much. Thank you. That's a song called..uh 'New Languages' from 'The Ladder' and..uh. Uh..we're gonna do a song. Uh..A short new song, I think. Yes. Just looking down. This one's for Jane, there you are. Hi. Wonderful, wonderful Jane. Thank you.